Designed to weigh 10-12% of your body weight, the InYard Weighted Blanket can be used to help naturally combat anxiety, insomnia, and PTSD. Similar to the feeling of a hug, the added weight of the blanket calms the body's "fight or flight" response. This compression therapy not only has an overall calming effect, but promotes a more restful sleep. NATURAL STRESS RELIEVER. The InYard weighted blankets use Deep Touch Pressure to combat mild to severe symptoms of anxiety, insomnia, ADHD, and PTSD. This compression reduces the stress hormone cortisol and calm's the body's "flight or fight" response. This not only calms your body but eases your mind, preparing your body for sleep. IMPROVED MOOD. Deep Touch Pressure mimics the feeling of being hugged by evenly distributing weight across your body. This stimulates the release of serotonin, giving you a sense of calm and relaxation while improving your mood. NATURAL SLEEP AID. The therapeutic blanket combats insomnia by naturally increasing melatonin production. This means that you will not only fall asleep faster, but have a full night of restful sleep. GREAT FOR SPECIAL NEEDS TEENS. The Deep Touch Pressure stimulates sensory receptors and strengthens the proprioceptive system. This sensory input is great for teens who have Asperger's, SPD, Restless Leg Syndrome, and Autism. PREMIUM MATERIAL. 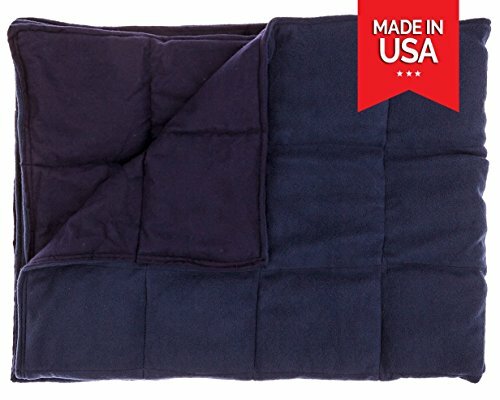 Proudly made in the USA, our weighted blanket is soft to touch and will quickly become your favorite blanket to sleep with. The blanket is 100% flannel on the back 100% polyester on the front and filled with non-toxic, hypoallergenic plastic poly pellets, similar to those used by Beanie Babies. Hand washable and air dry.